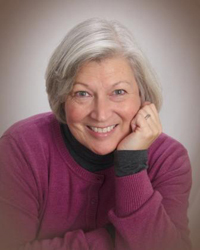 It’s hard to believe that we’re up to our tenth author spotlight in this series, but here we are, with an introduction to Jo Marshall, who spent seven years as a volunteer literacy tutor for elementary school students. In the D.C. area, from 1999 to 2006, she worked as the Legal Assistant for the General Counsels of two nonprofits–the Paralyzed Veterans of America and Oceana. Jo earned a B.A. in German Language and Literature from the University of Maryland, Europe and, from 1984-1987, she worked as a liaison between the military and international communities in West Berlin. This is the first in our series to explore an author’s works aimed toward children, but rumor has it that adults also enjoy her stories! Still, it is perhaps our children and grandchildren who may more clearly understand the realities of climate change–and who will inherit the mess from our lack of responsibility to it. So, for authors exploring global warming in fiction, a children’s audience seems most apt. Jo’s Twig Stories series–the reading age is suggested at 8-12 years old–is a beautifully designed volume of four books thus far. 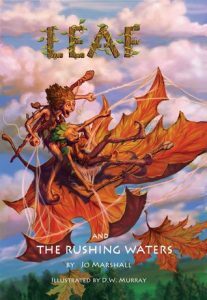 The first in the series, published in November 2011, is Leaf & The Rushing Waters. 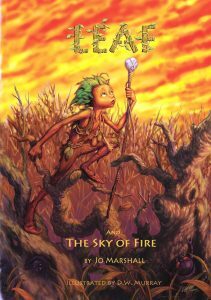 Since then: Leaf & the Sky of Fire, Leaf & the Long Ice, and Leaf & Echo Peak. You can see that Leaf is the main protagonist, and has a pretty sweet name to boot (also the name of my favorite character in the Game of Thrones!). Jo lives in the Pacific Northwest near volcanoes, rainforests, and coastal wetlands. She is concerned about climate change impacting the wildlife and forests in this region, and so her timely eco-literature novels describe this transforming world by means of fantasy adventures involving Twigs. Twigs are “impish stick creatures no taller than robins” and have leaf sprouts growing on their arms and legs, their toes curling like roots. Their hair and eyes reflect the color of their local trees. Children will learn about all kinds of trees, such as red cedars, emerald leaf maples, silver leaf poplars–but also kids love adventure, and the Twigs certainly have plenty of that as they must save themselves from various environmental crises beyond their control. In doing so, the Twigs are very crafty, learning how to make tools from their surroundings and fighting with courage while working with other forest animals. They live in knotholes of ancient trees. Twigs stick together to survive! I’ve known Jo for a few years now, featuring her books when the dragonfly.eco site first began, and I enjoy her work–having ordered the first of her books for my niece a few years ago. Teaching kids about climate crises through fiction is something that just a few take on, though it is a growing trend. The Twigs are wonderful heroes to children, facing the same problems we are, but Twigs are smaller and more vulnerable and not at all the culprits. Twig problems reflect real problems, such as bark beetle swarms, firestorms, melting glaciers that flood and destroy the forests and valleys, and–in the latest addition–a daring escape from a volcano. In this series on authors who explore climate change in their stories, I often look at writing styles and world-building–and one conclusion I’ve come to is that no matter how strongly the author desires to warn the readers, by far the best approach to all fiction, no matter the subject, is just great storytelling. Jo succeeds, not just with fun, insightful, and adventurous stories but with art that vividly illustrates what’s happening. I recall being drawn to what I think of as “books of wonder” as a child. 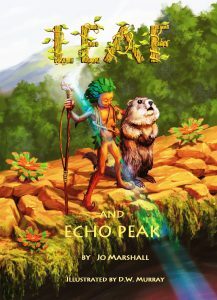 Fantasy, adventure, interesting illustrations–these things all appealed to me during my early reading years (and still do), and started me on the path to making our planet’s ecology my number one interest in all things. I had inherited some older storybooks from my parents, which were very focused on nature and the wilderness, though back then not all of these stories were particularly about environmental issues (whereas some books like Bambi, A Life in the Woods or The Giving Tree were). I read plenty of fairy tales, fables, and other fantasy stories where nature was eminent and ordinary characters became extraordinary through strength and determination. In many cases the wilderness was a strong character, such as the mysterious forests in Snow White and Hansel and Gretel, and of course many characters came from the woods, sea, or mountains, such as mermaids, elves, fairies, and ice trolls. Fables usually centered around animals, rivers, the sun, the moon, and the sea. In all cases, nature was bigger than life, prompting me to investigate my own local forests and rivers to find that certain otherworldly beauty–finding it to be real and delicate and yet wild and powerful, and in some cases just very weird. And the morals of these stories showed how we should be fair, kind, and wise in our journeys. Fables taught us to not be greedy, to respect others (people and the wild), and so on. 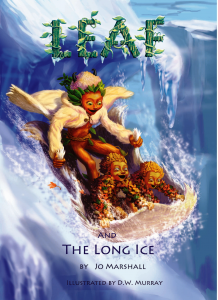 Most stories based on fantasy and funny characters engage children, so it’s easy to blend in natural facts and climate change events into the Twig Stories adventures. What makes these eco-journeys significant is children experience the frightening impacts of a warming world–melting glaciers, endangered wildlife, floods, and wildfires through the experiences of Twigs. Some children become aware of climate change for the first time because of Twig Stories, and others feel a desire to help mitigate its effects. That’s a wonderful goal and that’s what makes environmental storytelling important. When my daughter was in 4th grade we imagined Twigs playing in the old-growth forest in our back yard. It was just play as we created different characters living in the giant western cedar closest to us. Later, I was eager to share my experiences as a child camping at Yoho Kicking Horse Canyon in British Columbia with her, so we took a trip one summer. As we drove, our excitement changed to shock. Millions of trees were devastated by bark beetle infestation. It was heartbreaking to see dying forests. And we wondered how wildlife could survive. When we returned we imagined our favorite Twig, Leaf, as a hero battling the horrible, swarms of barkbiters, and rescuing other Twigs living in the dying forests. That became Leaf & the Sky of Fire. Twig Stories’ royalties are shared with nonprofit groups concerned with wildlife protection, climate change research, nature conservancy, and forest preservation. 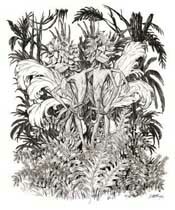 Book illustrators include Ali Jo, who helped to illustrate a climate change for kids gallery , “Watch Over Wildlife,” interactive Twig Play section, and other design/illustrations on the website, as well as D.W. Murray, an award-winning Disney and Universal Pictures artist whose screen credits include Mulan, Tarzan, Lilo & Stitch, Brother Bear, and Curious George. An award recipient of the prestigious New York Society of Illustrators Gallery, his talent is also recognized by the 2004 Gold Aurora Award. The Twig Stories’ illustrations are brilliant and vibrant! Jo Marshall’s Twig Stories have been lauded by Amanda Swan, Director of Development & Communications, The Lands Council; Dr. Edwards, Manager of Education, The British Columbia Wildlife Park; D. Simon Jackson, Founder and Chairman, Spirit Bear Youth Coalition, Executive Producer, The Spirit Bear CGI Movie; Dr. Tim Foresman, Director of Development & Communications, Professor & SIBA Chair in Spatial Information, Institute for Future Environments Queensland University of Technology; Abigail Groskopf, Science Education Director, Mount St. Helens Institute; Eleanora I. Robbins, PhD, Science Explorers Club; Gwenn E. Flowers, Associate Professor & Canada Research Chair in Glaciology, Department of Earth Sciences, Simon Fraser University; Sarah Boon, PhD, Associate Professor, Geography Alberta Water and Environmental Science, University of Lethbridge; Clay Heilman, Environmental Educator, Nature Vision – Environmental Education Non-profit, Woodinville, Washington; Joanna Marple, Miss Marple’s Musings; Heidi Perryman, Ph.D., President and Founder, Worth A Dam – Martinez Beavers.org; Sharon T. Brown, M.A., Director and Wildlife Biologist, Beavers: Wetlands & Wildlife; Erik, This Kid Reviews Books; Wayne S. Walker, Home School Book Review; Jennifer, A Tale of Many Reviews; Dr. Diana L. Six, Professor, Department of Ecosystem & Conservation Sciences, Integrated Forest Entomology/Pathology, University of Montana, Six Lab; Rose Sudmeier, Sixth Grade Teacher, Snohomish, Washington; Paula Hawkins, Retired Social Worker, Reno, Nevada; and Dr. Richard W. Hofstetter, Forest Entomology Professor, School of Forestry, Northern Arizona University. December 17, 2012. “Nature and Fairy Stories” by Sara Matiland. Huffington Post. March 2, 2014. “Children’s Fantasy Literature: Why Escaping Reality “is Good for Kids,” by The Conversation.